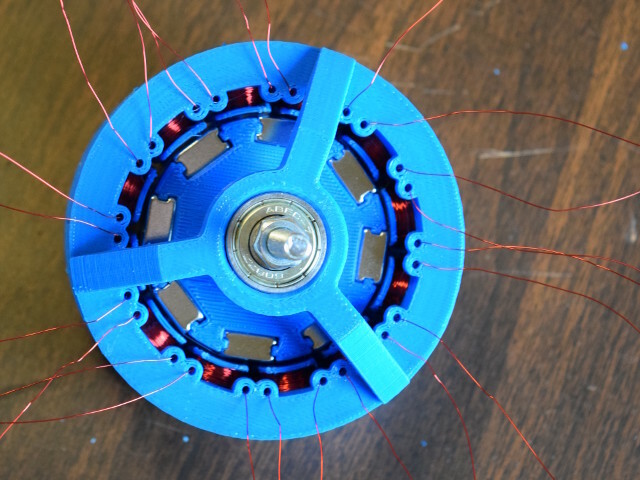 A few months ago, our Brushless DC Motor article demonstrated a very simple electric motor. With some magnets and coils of wire, we were able to make a motor spin. A generator works in much the same way, only backwards. Instead of feeding in electricity to create motion, we can use a similar device to convert motion into electricity. This month, we’ll build a generator like those used inside a wind turbine. We’ll keep it small, with the modest goal of simply lighting up an LED. An electric current will be produced in a coil of wire if the magnetic field changes within it. Everything we do from here on out is simply trying to do this better. We started with the RC4CDIA diametrically magnetized ring magnet. This will be our rotor, the spinning part of the wind turbine. 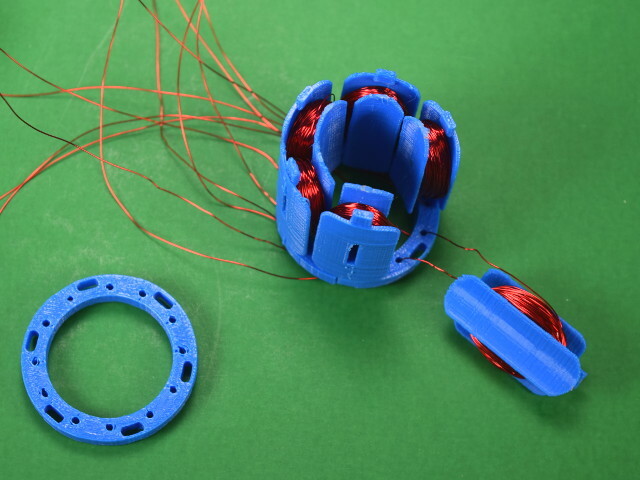 We 3D printed a 3-coil stator, the stationary part of the motor. It is a radial flux assembly, where the coils are arranged radially outside of the spinning magnet. We managed to fit about 250 turns of 30 gauge magnet wire onto each coil. Consider what each coil “sees” as the magnet spins. What’s the average field strength inside the coil? It changes from some positive number to some negative number as the magnet spins. Say it’s +1,000 gauss to -1,000 gauss. During half a rotation of the magnet, the coil sees the magnetic field change by 2000 gauss. This change in magnetic field induces a current through the wire. How much current? It is proportional to how quickly the field is changing. The coil only “sees” the magnetic field through the axis of the coil. 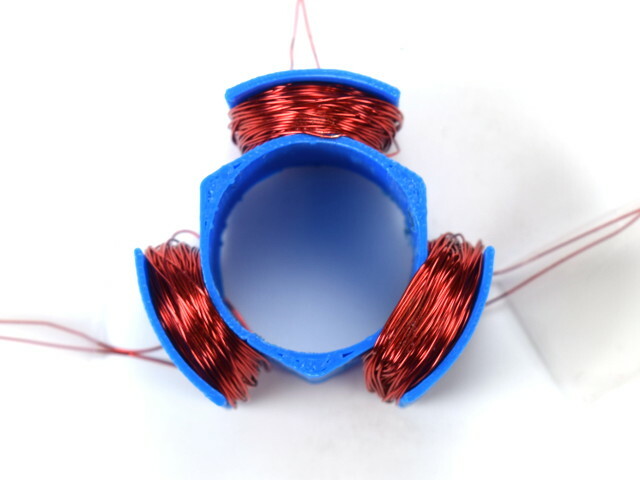 For the top coil in the picture, it sees only the magnetic field in the vertical direction. When we get the magnet spinning, the electric current coming out of each coil isn’t a constant, steady thing. Both the amount of current and its direction will vary. This is not very helpful for us. We want to use the electricity for something useful, like charging a battery or lighting an LED. We want a more constant DC source, or at least, a voltage that’s always positive! To accomplish this, we hooked up the coils in a Wye configuration, where we treat the generator like a 3 phase source. We wired up those coils in a Wye into a bunch of diodes to rectify the output – make it all positive. The electrical nerds here at K&J want to talk more about this circuit, how it’s commonly found in so many other places, etc., but this is supposed to be about magnets. So, here’s a picture of the circuit, and we’ll move on for now. 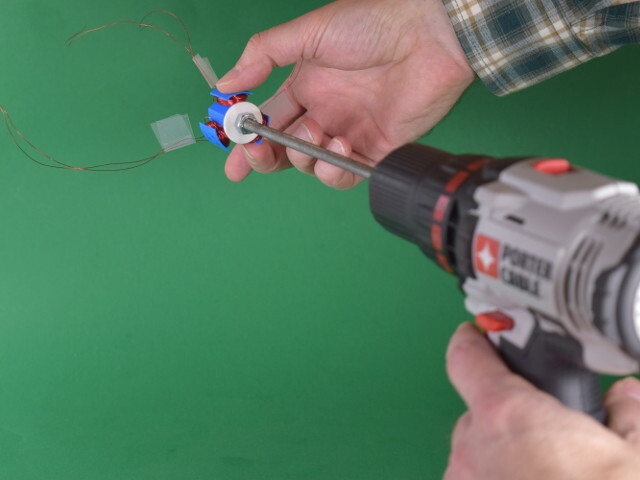 To try it out, we spun the magnet with a battery-powered hand drill. It produced electricity, but not as much as we hoped. The output was less than a volt, not enough to power our LED that requires about 3 volts or more. How can we get more voltage? We turn back to Faraday’s Law, which says that the voltage out is proportional to the number of turns of wire. If we double the amount of windings, we should get double the voltage. The problem is, if we just add more and more windings, the coils get very big. Those larger turns are farther and farther away from the magnet, so they’ll “see” less magnetic field strength than the turns closer to the magnet. What can we do? We thought we might get tricky and double the number of turns by adding extra coils. With 3 new coils, 180° turned from the first coils, we could effectively double the number of turns. This also worked – it produced some electricity when we spun the magnet inside the stator. While it increased the voltage compared to our first try, it still wasn’t enough to light the LED. Also, we really had to spin the drill at maximum speed to get this output. 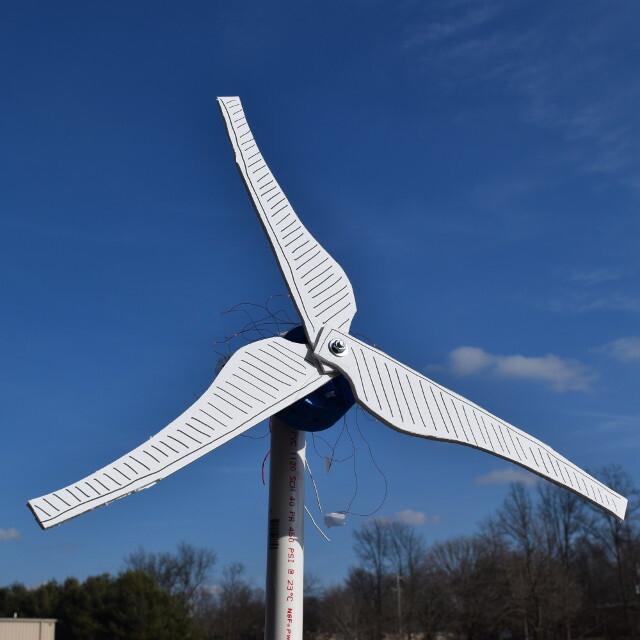 For an actual wind turbine, we need to see a decent voltage while it’s spinning slowly. How can we do this? We know that more turns of wire in a coil (or coils) can increase the voltage. We also know that the greater the magnetic field change, the greater the voltage. If we can change the magnetic field back and forth from north to south more times in a single rotation, we’ll get more voltage. So, let’s try more of everything! We wired the 12 coils in much the same way we did before, except each of the three Wye legs has 4 coils wired in series. Each of those 4 coils sees the same magnetic picture as one another, so the induced voltages add up. 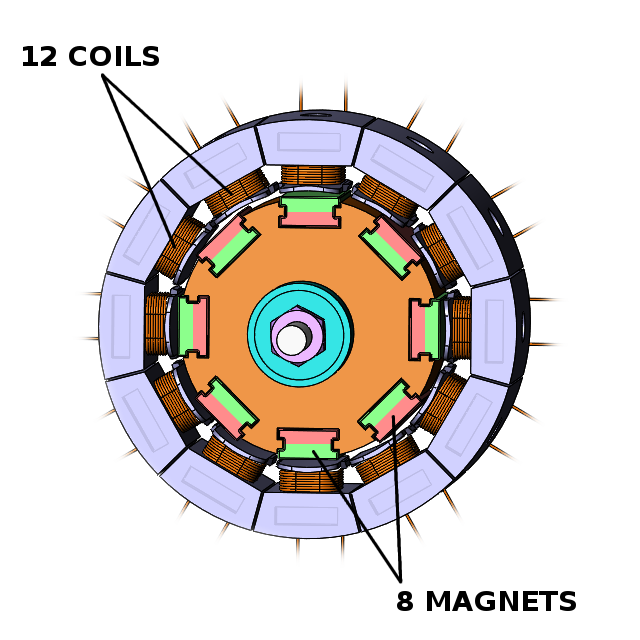 An individual coil sees the magnetic field change from north to south 8 times for each rotation of the rotor. This has got to give us more power! Check out the video below for a quick synopsis of our build. It works! Even just spinning this generator by hand, we were able to produce enough electricity to light the LED. It was easy to see 4-5 volts coming out of this. In the last seconds of that video, we spun the generator with our handheld drill on its fastest setting. We easily produced 20V across our circuit! At under 1 Watt of power, we’re not quite ready to disconnect from the grid using this device. It's going to need some serious improvements to make more power. Still, it was a fun demonstration, illustrating the concepts behind larger wind turbines that do provide useful power! Have fun, and be sure to drop us an email with pictures of your own electricity generating projects with magnets! UPDATE: STL files for 3D printing these models can be downloaded. Here is the 3-coil stator. Here is the assembly for the 6-coil stator. Here are the parts for the big, 8 magnet, 12 coil generator.